Forget about the National Earthquake Information Center (NEIC), the U.S. Geological Survey, and for that matter, the animals at the Smithsonian National Zoo. In the wake of the East Coast earthquake and as we wait for the arrival of Hurricane Irene, we have turned to social media for answers and to share our personal experiences with the world. The value of social media has been rising for some time with even the naysayers starting to get on board. This summer we have seen the true value of social media, Twitter in particular, come to life with communication about natural disasters. While cell phones refused to send messages or make calls for many following the rare quake in Virginia on Tuesday, there seemed to be little issue connecting to Twitter, Facebook, and the like. Reuters reported that in the minute following the earthquake, 40,000 tweets were released in relation to the occurrence. If you’re anything like me, it took you a few minutes longer to tweet yourself as you first checked your local meteorologist’s account to see if that strange rumbling was indeed an earthquake. Of even greater value is the ability to receive apt warning for anticipated natural disasters. 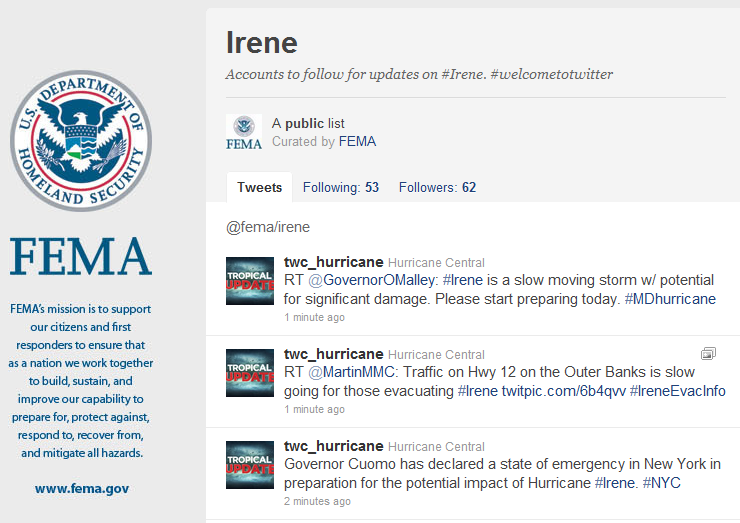 With Hurricane Irene threatening the Eastern Seaboard over the next several days, meterologists, politicians, and government agencies are all turning to their social media accounts, more aware now than ever that this is perhaps the most effective way to reach the masses. In an effort to make foresight as close to 20/20 as possible, FEMA has created a public list on Twitter that allows you to simultaneously follow a variety of resources from the National Oceanic and Atmospheric Administration to the American Red Cross. So maybe don’t “forget” about the anyone in the future but instead, find, follow, and get prepared.